KCDC Grand Opening! And a NEW painting! 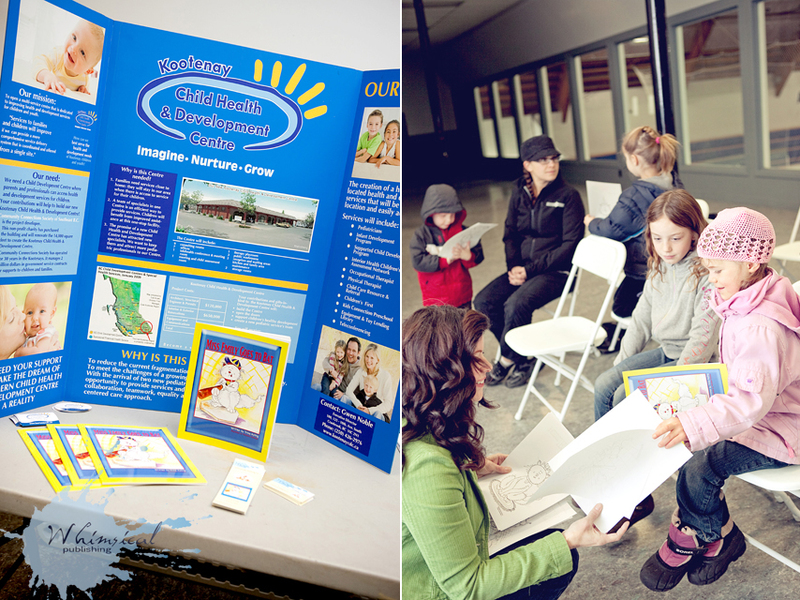 On June 15th the Kootenay Child Development Center held it’s grand opening! Although I didn’t get the chance to be there in person I was there supporting it in spirit. I totally believe this place is an indispensable addition to the East Kootenays – it is going to be a such blessing to families and children around the region. If you don’t know much about the benefits of this center please DO check out this link to read more >>> KCDC Project Details. 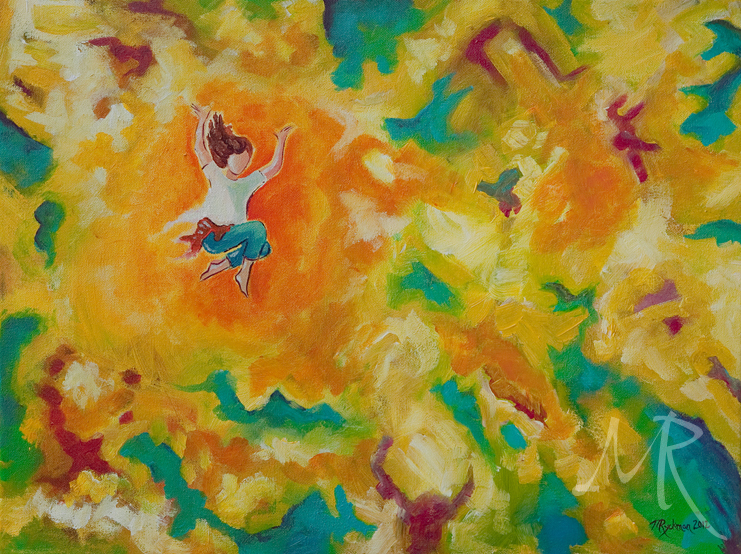 ‘Unspeakable Joy’ – 18″ x 24″ – acrylic on canvas. Please click on image to see enlarged version. So you still might be wondering where exactly do I come into all this and what does my newest painting have to do with it? Well, Gail Brown is actually retiring soon and as a memento of all her efforts and dedication I was commissioned to do a painting in her honour that will hang in the center. The painting is titled, ‘Unspeakable Joy’ and it was presented to Gail at the opening. It was a serious privilege to do this piece and my heart is that it reflects the untainted joy that we see daily in our children. Miss Emily the Cat at Home in KCDC! 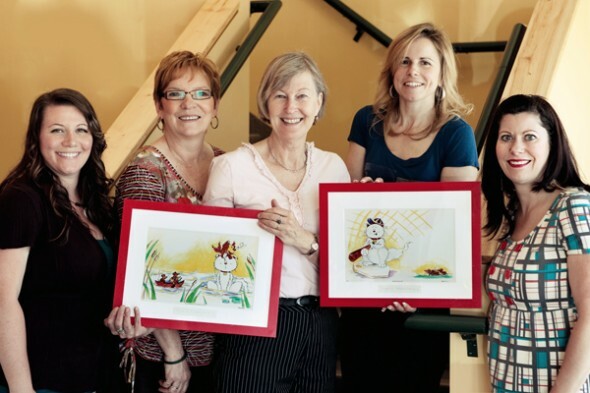 It has been such and honour to help support this important endeavour – and we are so excited to have these prints framed and hanging in the Kootenay Child Development Center! Read more by clicking the following link >>> MISS EMILY THE CAT AT HOME IN KCDC! Kootenay Child Development Centre Opens April 1st – No Fooling! The Kootenay Child Development Centre officially opens its doors on Sunday, April 1st, 2012 and I couldn’t be more excited for the families here in the Kootenays because I know how needed these services are and how hard people have worked to make this Centre a reality. You see, even though there’s an estimated 700 children with disabilities in our region the nearest community of specialists is a 4½ hour drive through the Rocky mountains away. And, even though we’re the only region in BC without this type of centre it wasn’t until last week that the provincial government announced it would provide $100,000.00 funding to our region for a child development centre. Our community didn’t give up on doing what’s best for the children and families in our communities. In 2009 Community Connections Society of South East BC purchased the old Shannon’s Fabrics and planning and fundraising efforts began in earnest. Thanks to the organizational and fundraising efforts of Gwen Noble, Jan McGinn, Patricia Whalen, Gail Brown and others and the generous support of families, individuals and businesses the Society has raised over $900,000 of its $1.1 million goal since 2009. Anyone who’s familiar with Whimsical Publishing and Miss Emily Goes to Bat knows that Micheline and I are a part of that enthusiastic group of Kootenay Child Development Centre (KCDC) supporters. When we first launched Miss Emily Goes to Bat we did a number of library and classroom readings and pledged 20% of our retail sales to the Centre. We’re also excited to donate two signed, numbered and framed prints of Miss Emily to the Centre. For more information on the Kootenay Child Development Centre and some of its incredible sponsors or to make a donation visit the KCDC website at www.kootenaycdc.ca.